Born in Germany, I live and work in Linz, Austria. I work as a textile and new media artist using drawings, objects and installation. I have developed an understanding of art as a collaborative and communicative event, which underlies my work and teaching. My interest focuses on archive, cultural practices and common fields of artistic production and economic necessities. I have had exhibitions using installations, performance, video, internet, text and textile in public art institutions and site-specific situations. I travel and develop my skills and practices in foreign working situations. My work has been shown at home and abroad. As an artist I suggest, involve, provoke. Being a woman, my gender shapes the way I approach and encounter reality. I trust in the God Jesus Christ refers to. Yet, ‘artistic’, ‘female’ and ‘Christian’ are adjectives I like to challenge. Centuries of art production, feminism and biblical theology provide the references I need. 1. RESPOND. The Red Cards, 21 x 10,5 cm each, belong to a long term archive called p_p (personal practice). I cut out images from printed flyers in my postal mail, which are sent to me by international aid organisations to inform me about the need to donate money. Mounted on cards these clippings undergo a long process of dyeing, pressing and preserving. Cards turn out with fragments or even empty, others show the mould of a credit card. As a teenager I often asked my parents who had experienced the Nazi regime in Germany: ‘What did you know then?’ I intend to document what I have known (and not known) in my lifetime. 2. RECONSTRUCT. 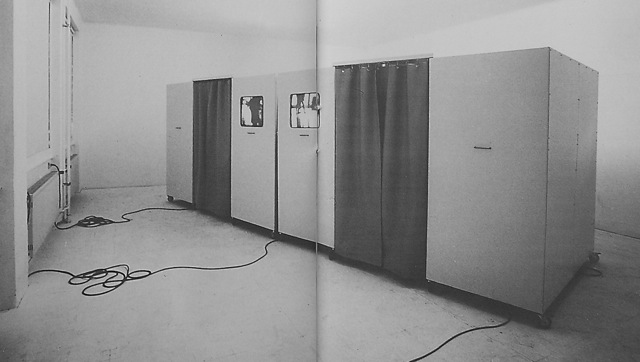 The video installation Zwischenraum, 1993, 200 x 210 x 650 cm and 2 video loops, each 60 min, screens architectural spaces in public institutions such as airports, hospitals and offices through windows in metal cabins on wheels: places in between, where humans get processed. As a collaborative project with Betty Spackman from Canada this artwork was developed, financed and exhibited in Linz. In 2002 theDanube flooded my storage and the rusted metal needs sanding and new paint. The videos got already digitized to fit contemporary technology. Since the price is such a bargain it would be a good idea to commission a new documentation concerning the situation at public institutions 20 years later. 3. REINSTALL. On site inVilnius, Lithuania, I came across the Church of the Sacred Heart of Jesus. During the Soviet occupation the Sisters of the Visitandines left the convent and the state authorities opened a prison in the buildings. On the inside the church itself was no longer visible after the prison had left in 2007. I attached textile fibre to the walls and imprinted the pattern of the existing architecture on it. I numbered the many pieces to be able to reconstruct the space. This textile skin - now left behind - is meant to remind the viewers of the history of this building and the lives of its former residents. During 2008 – 2010 I developed this site-specific Art Installation as well as exhibitions and performances for Vilnius as the European Capital of Culture of 2009. This project was carried out in collaboration with Marie-Françoise Stewart-Ebel, Brussels, while we investigated the relationship between art and culture. Events, such as workshops, lectures, films, etc., were invitations to meet and share the process of rediscovering which linked this location to the order of the Visitandines and the biblical narrative of Mary visiting Elisabeth, both with child, relating it to women's experience and muted history. 4. REMEMBER. Textile pockets can be combined in different ways and therefore are intertwined in a net of various connections. As for other social networks people leave their information on site at the installation and add their comments on cards with handwritten notes. This basic idea was applied to the interactive space installation School Memory, HBLA (Höhere Bundeslehranstalt) for Artistic Design Linz, 2012. It enables participants to have encounters with a large number of people who have contributed to the 30-year history of this school. The exchange of memories and mementos and their accumulative presentation and mediatization creates a space of communication that can be used interactively, while simultaneously establishing an archive. In Brussels the digA_tex, Digitales Archive, textile version’, 2004-2008, is located at the Centre d’Archives pour l’Histoire des Femmes a.s.b.l. It refers to the Digitales Working Days at Interface3, a vocational training centre for women in new technologies. The various lectures, workshops, forums, panels, discussions were documented and are available on posters, VHS, Hi8, minidisk, CDs, print out and online. All these documents influenced each other and can be traced back. The textile bags form an archive in material reality. The tactile experience of packing and unpacking, the flexible combinations of pockets with different contents and comments turn the users into acting persons searching the appropriate archive.